National Night Out and "Trunk or Treating"
Three different CITY events at three different sites will give residents the opportunity to take care of their big spring cleaning projects. For Lago Vista residents only - ID required. LIMITED ITEMS TAKEN. For disposal of: NON-HAZARDOUS RESIDENTIAL WASTE ONLY including appliances (refrigerant removed and properly tagged by a technician) electronic waste (computers, laptops, printers, tablets), furniture, plastics, scrap metal, and wood products. BAGGED-ONLY LEAVES will be accepted at this location. Not accepted: NO BRUSH OR TREES (see Green Center below.) No asbestos, commercial waste, boats, items with fluids inside (freon, gas, etc. ), or other hazardous items that go to the BOPATE Hazardous Household Waste Clean Up as outlined below. 21155 FM 1431 - 1/4 mile west of Lago Vista Middle School. For Lago Vista residents only - ID required. For disposal of: The City's brush collection/mulching station. ONLY GREEN BRUSH or TREE LIMBS will be accepted. Tree limbs must be 10" or less in diameter. For disposal of: the following HAZARDOUS household waste ONLY. 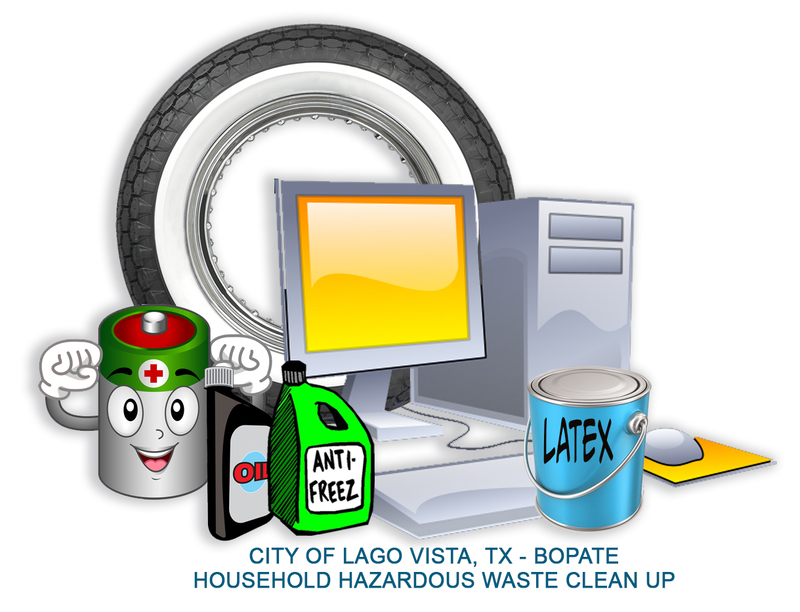 PLEASE refer to the City of Lago Vista website or call City Hall for more details and instructions BEFORE bringing items to these sites. Each site will be able to accept ONLY those items listed as acceptable. In addition to the three City of Lago Vista events, Keep Lago Vista Beautiful once again spearheads the 2019 Don't Mess with Texas Trash-Off. 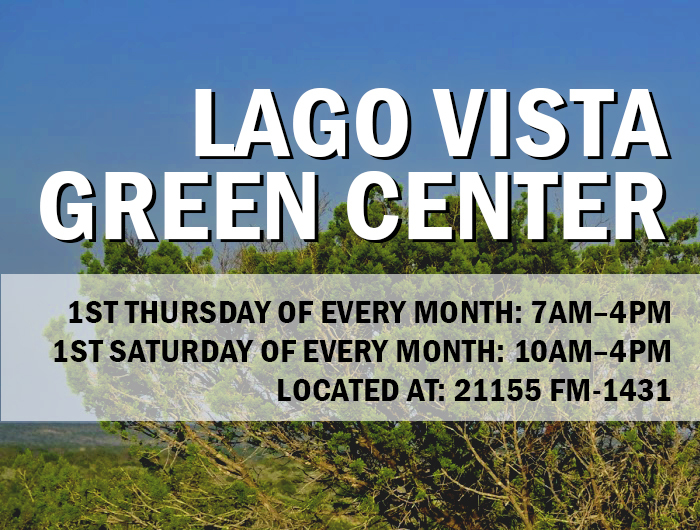 KEEP LAGO VISTA BEAUTIFUL welcomes 2019 TRASH-OFF volunteers to a special breakfast kickoff at 8 AM in front of City Hall at 5803 Thunderbird. Trash-Off encourages Texans across the state to join forces and clear Texas roadsides of trash. Millions of pieces of litter accumulate on our roadways each year. Everyone can volunteer to help. For details visit www.klvb.org org call Mike Leitko at 512.923.6725. For advanced volunteer registration, email mikeleitko@yahoo.com. KLVB accepts old flags for proper disposal courtesy of the Boy Scouts. LISTEN TO ONLINE STREAMING OF LAGO RADIO 1670/AM HERE.